CUPERTINO, CA (PR Buzz) – December 19, 2018 – – Success is not defined merely by the riches you have earned in your lifetime. It is something that goes beyond the physical. Success is when you have lived for others sincerely, without asking for anything. Being a catalyst for success requires a good heart and passion for helping others out of the dark. A giver feels so much better than a getter. But if you do give, pour yourself out so that you fill the emptiness in another person’s life. “Being a Catalyst for Success” author Bill Wallace is a certified professional coach and mentor who inspires and empowers people through his experiences in life. He is also the founder of Success North Dallas and an active member of the C-Suite Network Advisors. Even with his busy and promising career, he is always available for expert advice on success, business, and excellence. 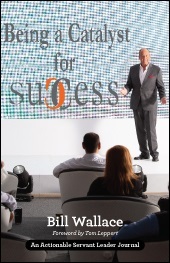 This book™ comprises 140 AHA messages™ of inspiring words by Bill Wallace, who has immense experience in strategic business support, mentorship, and leadership. He believes that anyone can be a catalyst for success if one has the right mindset and passion. Success is not about money or power, but rather about a simple heart for doing good and being there for others. These beautiful quotes will help you feel enlightened to care for others by giving yourself entirely. A happy and successful life filled with love and contentment is better than being rich and alone. A hardcover, paperback, and Kindle versions of this book are available on Amazon. You can download the Kindle version of this book for FREE until December 23! Grab your copy now: https://amzn.to/2B84Dk6. “Bill Wallace’s book serves as an inspiration for those who want to make an impact in other people’s lives. Putting others before yourself actually sums up how successful you are. A good life is a happy one that is shared with others wholly. May these powerful AHAmessages encourage you to live a life for others, without expecting anything in return,” says Mitchell Levy (http://aha.pub/MitchellLevy), The AHA Guy Thought Leader at AHAthat™ (https://AHAthat.com). To learn how to read and share AHA messages from this book, check out this video: https://youtu.be/Oyu6XRDpu9w. To learn how to automatically share via AHAblaster, please watch: https://youtu.be/XbungDgxUe8. Read and share AHAmessages in this AHAbook on Twitter, Facebook, LinkedIn, and Google+ by going to http://aha.pub/SuccessCatalyst.